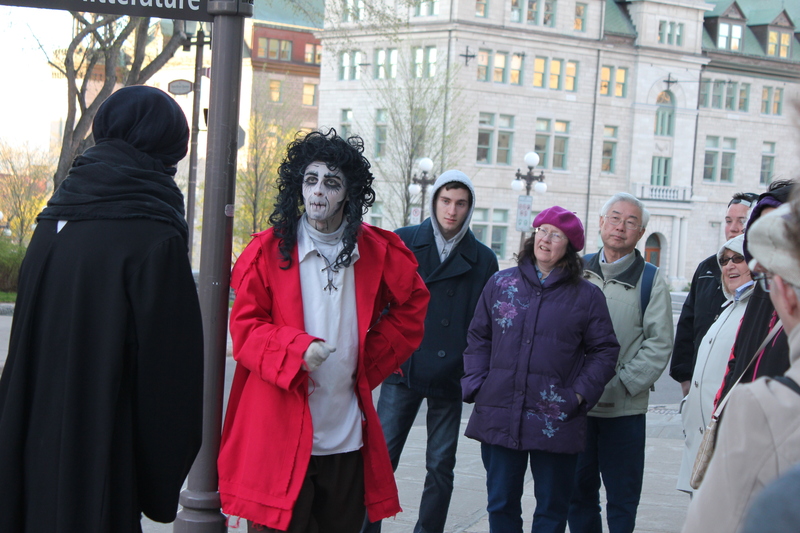 A Haunting We will Go – to Quebec! 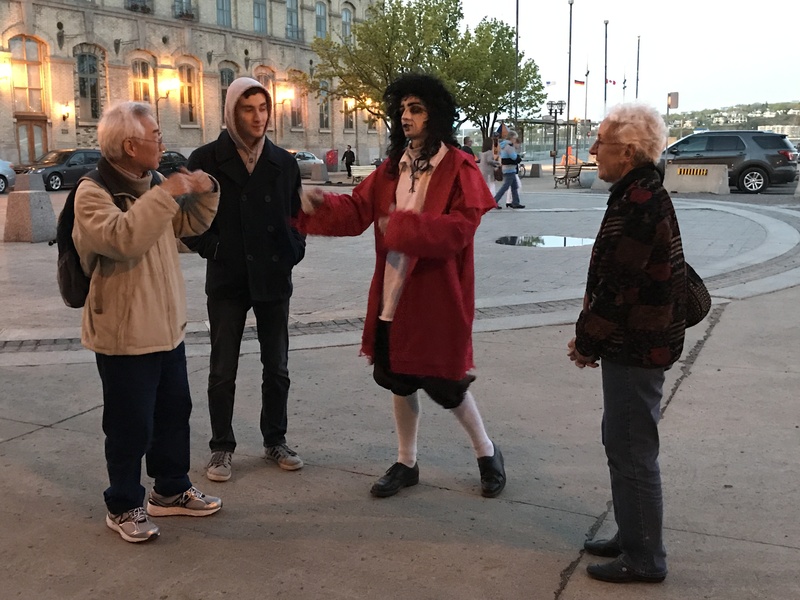 At the end of May, Yang and I had the good fortune to join the WSU French Club’s trip to Quebec City. 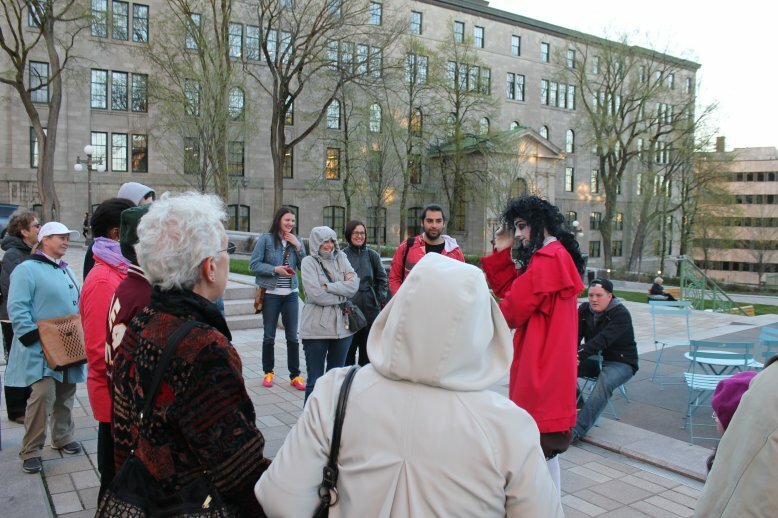 The tours of the history, churches, and gorgeous natural landmarks were wonderful but the treat of the treats was our Saturday night Ghost Tour of the city. 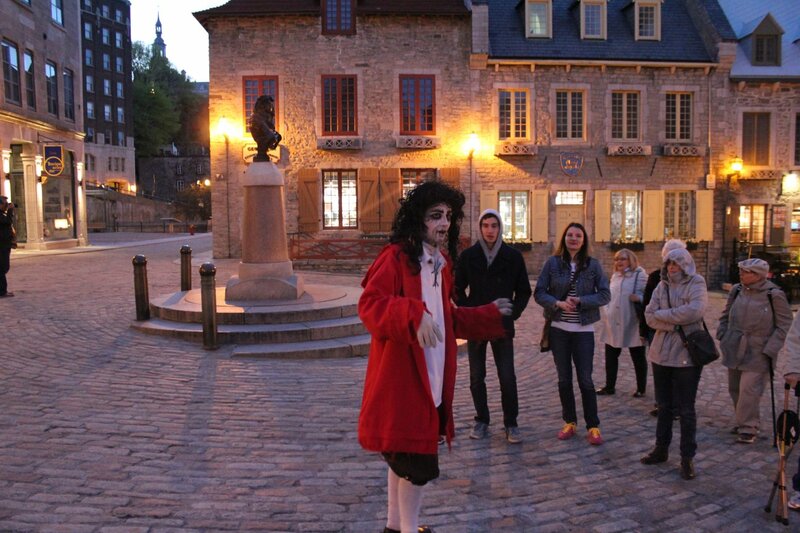 We gathered in an old stone courtyard on a lovely, softly lit evening and met our guide, a delightful ghoul who in life had been a city executioner in the 18th century. So, he could tell us the history, as well as the scandals, of city – both could be mixed! For example, we learned that he, like his predecessors and successors, got his job by agreeing to take it on in lieu of being executed for being involved in a fatal tavern brawl. Of course the aristocrat also involved got off while he had taken the entire rap – class privileges . . . Still, he had a wonderful sense of humor about the situation, and was always solicitous enough to warn us about the “evil machines” (i.e. autos) when we crossed the streets. 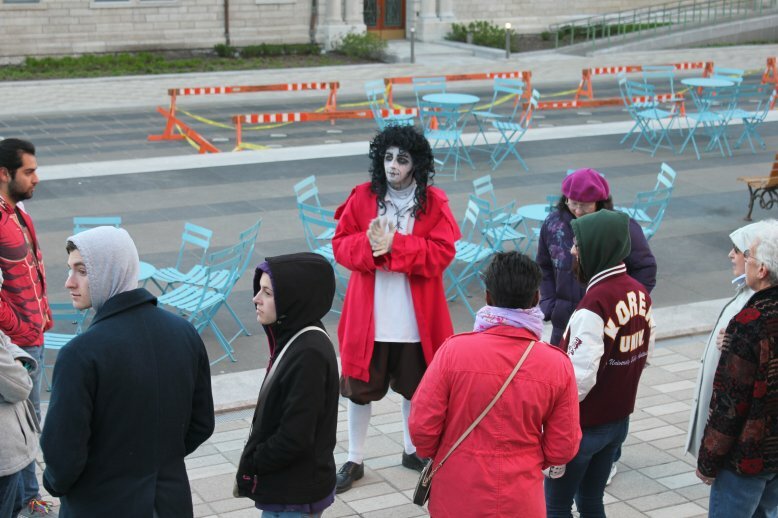 He also warned us against the various not-so-solicitous ghouls whom we met along the way. Listening to them bantering back and forth with our guide, we learned quite a bit about the laws, customs, and mores of the early settlement, with a healthy dollop of scandal thrown in. This lovely lady ghost is picking out one of the students to be her third husband, after the first two accidentally-on-purpose died at her hands. He looks a little nervous, doesn’t he? He managed to tap dance out of the situation deftly. My friend Kathy Heal(e)y on the right seems to be enjoying the situation. We also learned that the punishment for women who committed murder, even if they had no one to protect them from vicious or brutal husbands, was harsh and merciless, silently bringing home the injustice of pure patriarchal power. 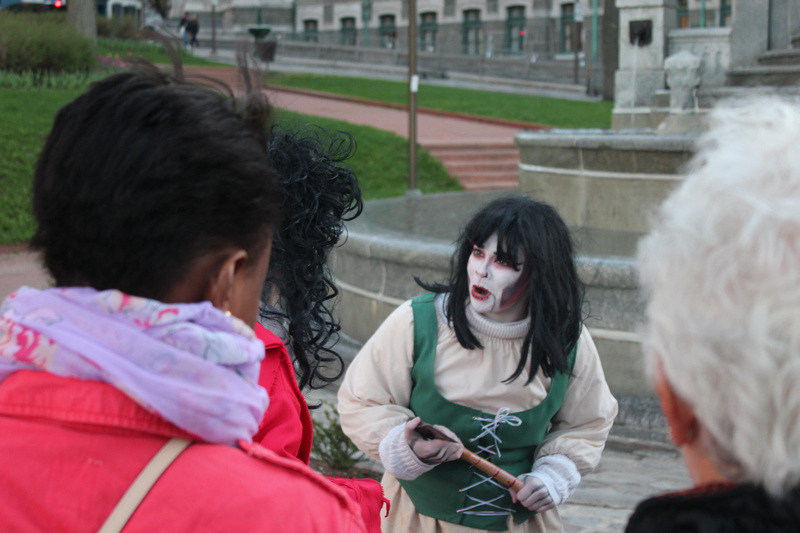 This charming ghost had an equally charming tale to tell about how a family friend traveling with her, her husband, and children went insane and axed them all to death. Well, she was lucky enough to crawl, wounded, to a farmhouse, tell her story, then die. Those Great White North Winters must have been brutal. 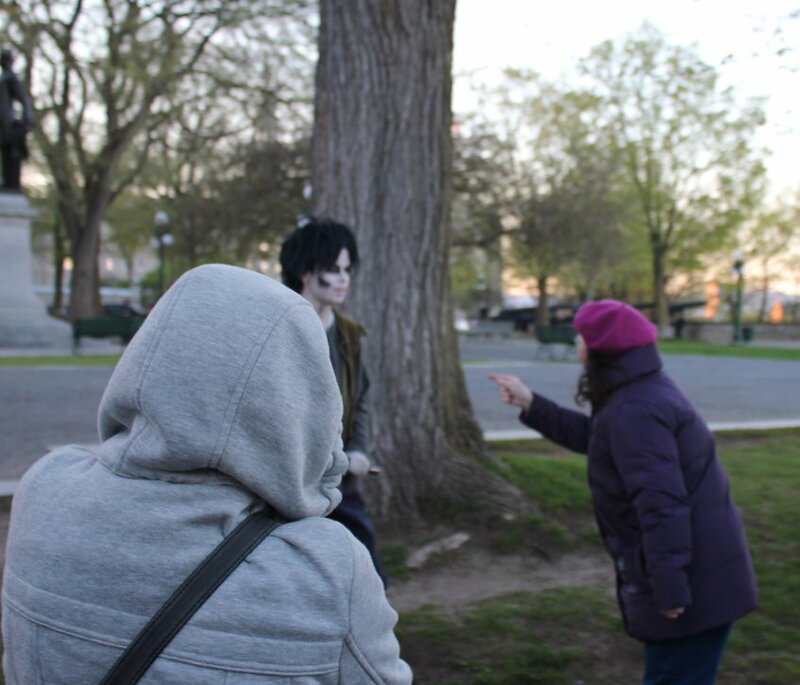 Then there was my encounter with the ghoul – a ghoul who had a grudge against our guide and planned to work it out with his axe – first on him then on us! So when our guide turned to me (!?) for support, I went into high gear. Forgive the plethora of pictures; I’m an unrepentant hambone! I went all method actory and reached within for fierceness. My motivation: plagiarism! 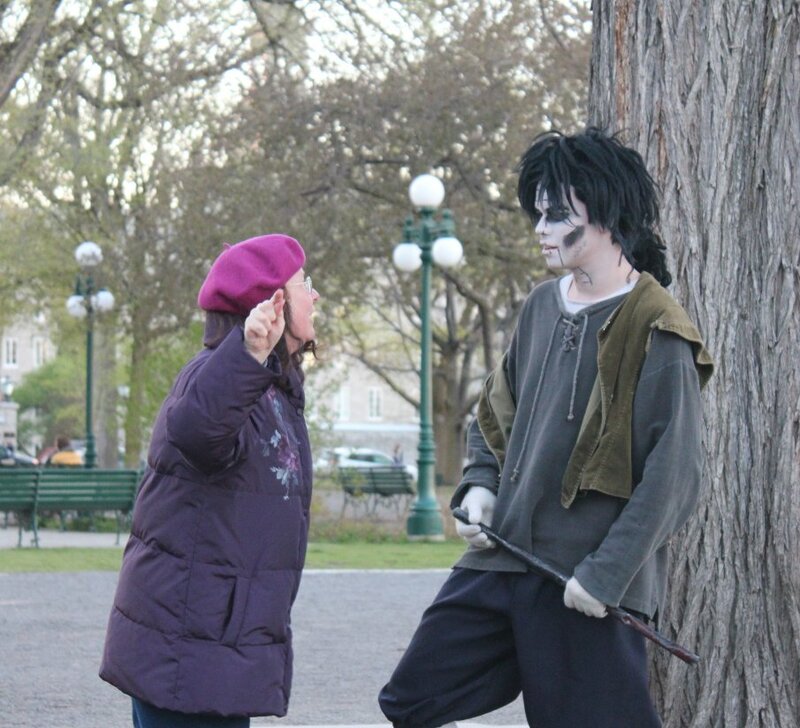 In my most lowering teacher voice, I threatened the poor haunt with every punishment ever devised in the Academic Code of Conduct for Cheating if he dared lift a skeletal finger against my friendly ghoul or the folks in our tour. I backed the poor soul across the square! It was quite liberating. 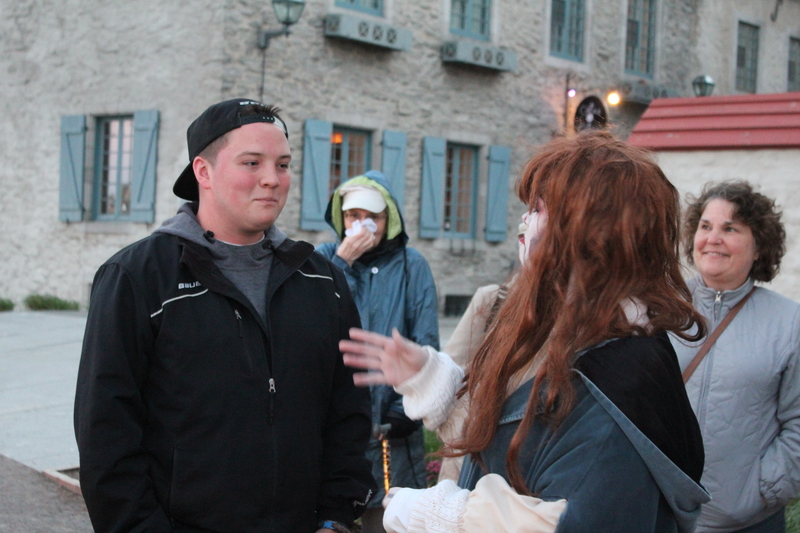 I think I scared a ghost! Ah, it was a tough semester! 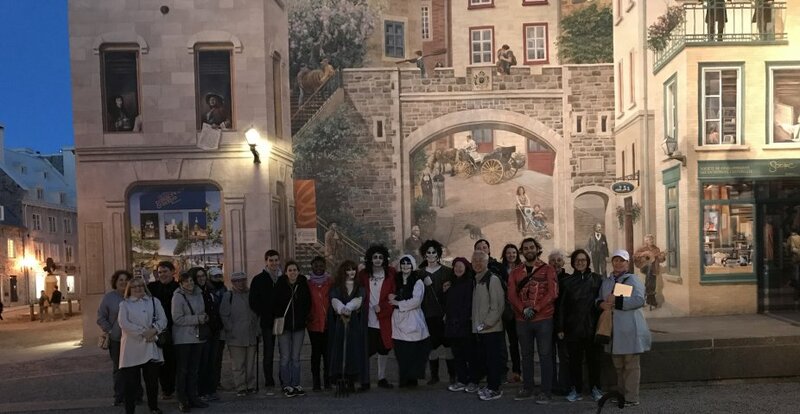 But at the end we moved down to the lower city where we saw all the neat, European-styled shops and heard tales of ancient churches and threats of revolt, before all coming together is the dusk to commemorate out journey into an eerie past with a wonderful troupe of actors!